Elizabeth Shutters builds closet and interior doors in our factory in Colton, California, the same way we make our shutters. 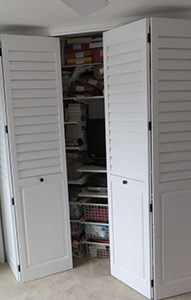 We use the finest materials available, over-engineered hardware, durable coatings and the hand-craftsmanship that has won Elizabeth Shutters every product quality and customer satisfaction award in the industry. 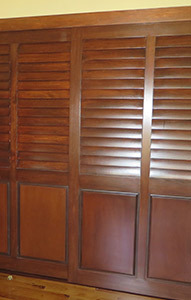 Custom, Solid Wood closet doors in virtually any shape, size, or color. Doors available in 100% whole Basswood, cedar-lined, MDX, MDF and specialty woods. Fixed louvers, raised panels, drop panels and combinations. Unlimited paint colors, standard and custom stains. Bi-Fold, By-Pass, single (hinged door), saloon doors, and custom configurations. All doors are made with solid wood materials, not hollow, plastic, or cheap metal substitutes. 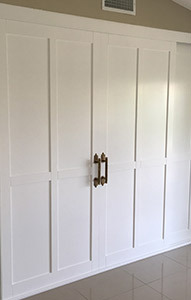 Custom made-to-order doors ideal for non-standard sizes, custom finishes and customers seeking to upgrade over cheap, hollow, metal and mirrored versions.